UPDATED 1:11P.M. 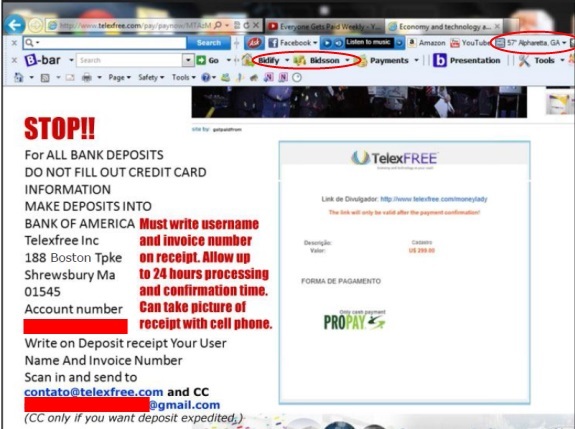 EDT (U.S.A.) Information reviewed by the PP Blog shows that promoters of the TelexFree MLM scheme instructed their recruits to deposit money into a TelexFree Inc. account held at a branch office of Bank of America in Shrewsbury, Mass. The recruits then were advised to scan the deposit slip and email a copy to a TelexFree.com email address and optionally send a copy of the slip to an individual dubbed a TelexFree “team leader” who was using a Gmail email address from Google. Recruits were told to photograph the slip using a cellphone or tablet computer before scanning it and submitting it via email, according to the instructions. The TelexFree promoter using the Gmail address had to ability to “expedite” the process of crediting deposits in the recruits’ back offices at TelexFree, meaning recruits purportedly could start earning money from TelexFree faster because their deposits would be credited quicker, according to the instructions. “Alternativey, you can contact your direct referrer, as several Promoters in our upline could also assist with direct deposits to their bank accounts and transfer funds to your registered account immediately,” the instructions note. The instructions, which appeared in PDF form in January 2013, were circulated on the Internet. Among other things, the instructions suggest TelexFree has insiders who can speed the flow of money and potentially are collecting the private information of their recruits and potentially subjecting them to identity theft. In the early part of the year, some TelexFree promoters worded online promos to suggest that the U.S. government had given the stamp of approval to TelexFree’s operations in the United States. The U.S. government does not issue such endorsements. It is somewhat common in the HYIP sphere for “programs” or promoters to plant the seed an “opportunity” has been approved by the government. TelexFree is under investigation by multiple agencies in Brazil, amid pyramid-scheme and securities concerns. (See BehindMLM.com story dated today on the denial of a TelexFree appeal in Brazil.) Whether a U.S. investigation is under way is unknown. What is known is that some affiliates in Brazil appear to believe incorrectly that the U.S. government has approved TelexFree’s operation. And it’s also known that the deposit instructions provided to TelexFree recruits strongly resemble the instructions given recruits of the AdSurfDaily Ponzi scheme broken up by the U.S. Secret Service in 2008. The agency seized at least 10 bank accounts held by ASD President Andy Bowdoin at Bank of America and at least five other Bank of America accounts held by an ASD insider. Those 15 accounts ultimately proved to hold about $80 million. At least one undercover agent followed ASD’s instructions to make a deposit at Bank of America and to fax the information to ASD, according to court filings in the ASD case. Federal prosecutors in the District of Columbia later applied successfully for warrants to seize the accounts, alleging that ASD was a Ponzi scheme using the U.S. banking system to sustain the scheme. Bowdoin later pleaded guilty to wire fraud and was sentenced to 78 months in federal prison. As appears to be the case in TelexFree, some ASD members also claimed an ability to speed the flow of money while perhaps making back-office exchanges with recruits. It is possible that ASD never knew its own real bottom line because of the back-office dealings of insiders and other sponsors, including promoters who instructed recruits to pay them directly instead of ASD. Some TelexFree affiliates have claimed that a payment of $15,125 to TelexFree will create an income of at least $1,100 a week for a year. The instructions on how to deposit money in Bank of America and scan receipts also claim that TelexFree is using a credit-card processor known as ProPay. Some TelexFree affiliates have claimed TelexFree also is banking with TD Bank. In those cases, affiliates are instructed to send money to TelexFree LLC — as opposed to sending it to TelexFree Inc., as was the case with the Bank of America instructions. TelexFree Inc. uses a Massachusetts address; TelexFree LLC uses a Las Vegas address, according to public records. 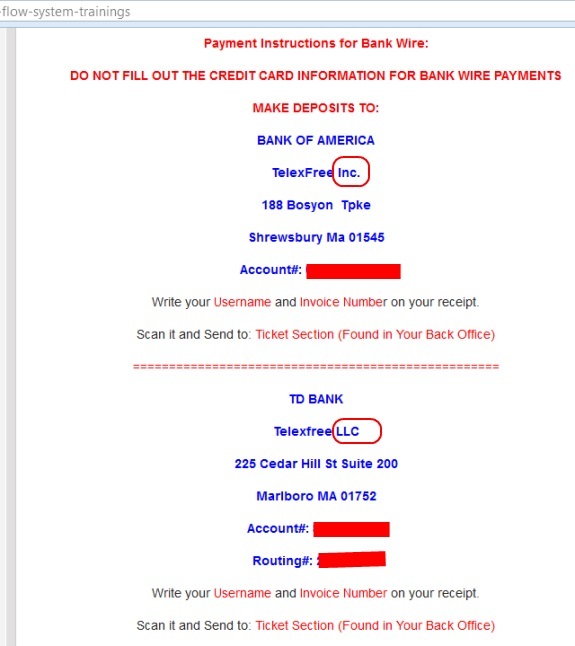 Why some promoters are instructing recruits to send money to the LLC version of the name at TD Bank while others are instructing that money be sent to the Inc. version at Bank of America is unclear. Quick note: We have a report that TelexFree affiliates are contacting large media outlets in the English-speaking world to complain the actions against the firm in Brazil are unjust and that the people are being oppressed. If this report is reliable — and it appears to be — the events in Brazil are following a pattern that emerged in the AdSurfDaily Ponzi scheme case. In the ASD case, there were bids to enlist the media, politicians and the American Association of Retired Persons to get them on ASD’s side of the argument. Some of the bids were just plain bizarre — like claiming then-Florida Attorney General Bill McCollum should be charged with Deceptive Trade Practices for holding the view that ASD was a pyramid scheme. Some ASDers said they mailed packets of Kool-Aid to Fox News host Bill O’Reilly to somehow sway him over to ASD’s side. Quick note: This Google-translated story suggests a TelexFree member filed a police report because someone enrolled him AFTER a Brazilian court blocked new registrations. I’m wondering if U.S.-based affiliates see any jeopardy in signing up recruits, given the situation in Brazil. Well, it looks as though they’re spamming the Facebook site of the Los Angeles Times, the website of Time magazine, the Facebook sites of politicians and, apparently, the Facebook site of David Beckham. Some people just don’t know when to come in out of the rain. Talk about drawing a bulls-eye on yourself for the authorities. If they weren’t investigating, they sure will be now. These people deserve everything that is coming to them. Some people just don’t know when to come in out of the rain.Talk about drawing a bulls-eye on yourself for the authorities.If they weren’t investigating, they sure will be now. It might be that for many in Brazil, this is their first experience in something like this. However, one thing is certain, once they are on the radar in this situation it almost always signals the end. A hard lesson many will have to learn. These appear to be dated April 24, 2013. The claims appear on sites slugged telexfreeunitedkingdon.weebly.com and mytelexfree4u.blogspot.com and telexfreeunitedstates.com. So, this leads to questions about whether TelexFree had the “Zeek problem” — i.e., whether the banks pulled the plug on TelexFree. Longtime readers will recall that Zeek — on Memorial Day 2012 — mysteriously announced it had closed accounts at two U.S. banks. Quick note: Longtime readers will recall that the government alleged in the AdSurfDaily Ponzi scheme case that at least one U.S. bank closed an ASD-related account because it suspected a Ponzi scheme.